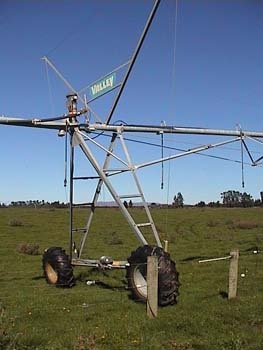 Sprong electric fence gates have been initially designed use with centre pivot irrigators, but other uses have been found since the first version was built in 1998. The first version is still in use to this day but a method of mass producing and speedier installation time lead to the final product being produced late 2004. Trials over the last 2 years with the current design have shown the Sprong gate to be extremely durable and very effective at stock control. The Sprong gate makes installing a pivot on an existing farm much easier because all the fences do not need to be replaced. The irrigator can travel through at acute angles to the fence line without the worry of wrapping up your entire fence line around the tyres. Should the pivot stop at the fence, stock control is still maintained unlike other methods where the fence could be under the tyre. Sprong Electric Fence Gate in operation since 1998. This System Works! © 2016 sprong.co.nz - All Rights Reserved.